2012 Holiday Gift Season | More Fun Than an Exploding Toy! I think new toy season is by far my favorite time of the year! Addmitedly, this year has been a strange year for me, being more into video games then remote controlled toys, but I am really excited that so many toy and R/C companies are pushing their new wares. In a couple of days I will post my top ten 2012 holiday gift list but until then, lets get a quick recap of some of my favorite toys to build, hack and break. In my opinion Legos are the quintessential toy! Every child and adult alike should have legos. They are fun, simple and they put your brain to work in very productive three dimensional ways. You can bet that I will have a toy from each of these categories on my upcoming list, but there are likely to be a couple lego sets. I am not much of a gas station impulse buyer, but the little $19 counter router desktop helicopters that you keep seeing pop up in every store that sells anything do keep sucking me in. I probably have the bits and pieces of ten of these in my parts bin by now. They are fun for a day or three, but I am way too tough on these things to expect one to stay around longer than that. There were recently some “TacoCopters” in the news and even one with a video (here) a counter-rotor helicopter in a cage to keep it intact longer that put ideas into my head. So maybe there is hope for a future Frankenstein version of all these little copters, but for now they are a rubbermaid box full of parts. This is where I would probably spend all of my money and time if I could. I am still totally in love with drones, and will continue to play with them for years to come. 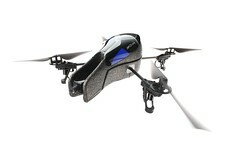 So for the bottom of my Category list, but the top of my list for Santa, you can be sure to find a drone!